Los Angeles hard rockers Buckcherry formed in mid-1995 after singer Joshua Todd and guitarist Keith Nelson were introduced through their tattoo artist; after cutting their earliest demos, the duo recruited bassist Jonathan “J.B.” Brightman and drummer Devon Glenn and began performing live, quickly earning a major following on the L.A. club scene. Following the subsequent addition of second guitarist Yogi, Buckcherry signed to DreamWorks Records, issuing their self-titled debut LP in 1999. 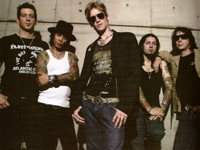 Singles such as “Check Your Head” and “For the Movies” were modern rock hits for Buckcherry, allowing them to raise their profile by summer 2000.